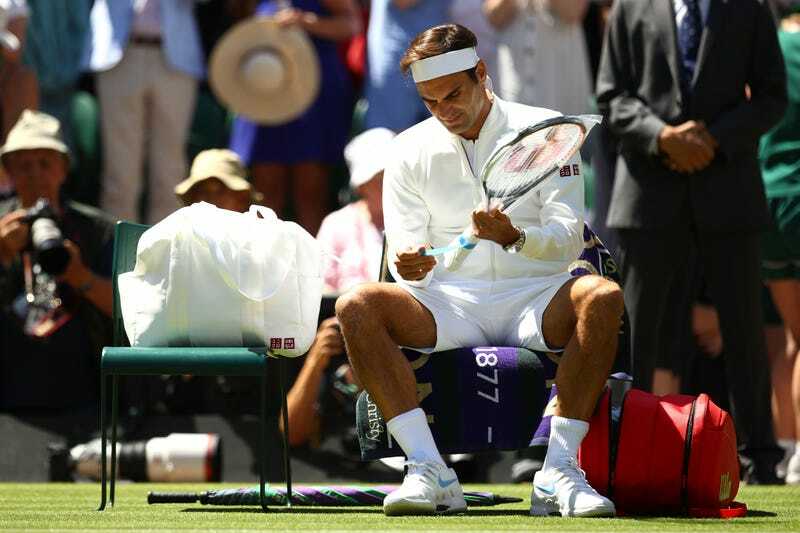 Roger Federer won his first-round match Monday at Wimbledon in straight sets, but as the tennis media would tell it, the most meaningful thing he did was pick out his wardrobe before the match. Try as I’d like to resist the perverse Rovellian fascination here ... I can’t. It’s weird. It feels weird. The extremely expensive substitution of some set of coin-sized marks for a new set of coin-sized marks on basically identical warm-up jacket and Wimbledon whites—it’s weird. To a longtime viewer, the sight of Federer in a new brand—at his preferred tournament, site of his most iconic matches—was a uncanny sensation. Like seeing your dad, after two decades of wardrobe homogeneity, settle down to Thanksgiving dinner in a whole new getup. After so many years of getting acclimated to and finding a benign comfort in those familiar sweatsuits and polo shirts and plain white athletic sneakers, you never expected any of it to change. The change is mild. Spiritually it’s dad garb all the same, but the sight of new colors and marks is just surreal enough to prompt a double-take, to make you wonder what went wrong with the old stuff. It turns out fans will still see some vestiges of the olden days, because Federer’s transition away from his old sponsor has not exactly been seamless. They may stay that way, too. “They have shown interest to have a shoe deal with me, as well. Ties are not broken there. I have deep roots with [the sponsor]. I’ve had a great relationship over the last 20 years. But everything is open,” said Federer yesterday. And so the battle for real estate on Roger Federer’s body rages on.